Thank you for visiting! Please look out for my other top 10 articles here on InfoBarrel. They are poverty signs and English Literature books and for travellers there is a guide to Las Vegas hotels. As a Scrabble playing champion I wish to help others to achieve good scores when they play and these 10 Scrabble words are a good starting point. If you can memorize these ten Scrabble words then you will find that your game will improve as you utilize them during the play of the game. It is extremely unlikely that you will get to play more than half of them in one game but once you are aware of the opportunities that exist with words such as QI and KA then you will become a better tactical player. 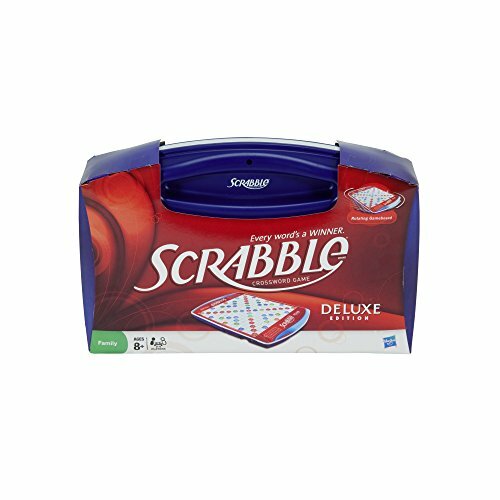 Tons of SCRABBLE GAME variety available from Amazon. I have ignored the color of the scoring squares as this article refers to the best words to place in a Scrabble game rather than the tactical maneuvering plays against strong opponents. Obviously, the placing of high scoring letters on double and triple scoring squares will increase your score but for these purposes we are just looking at 10 words to remember when next you play Scrabble. Playing Scrabble tactically in tournaments involves a different set of playing skills but the core job of finding high scoring words is what we are after here. You do not have to know the meaning of the words; you just need to know that they are valid to play in a game. However, sometimes the fun is enhanced if you know the meaning of the word you play so the words below include a brief description of their meaning. It also helps you to remember the word if it triggers and association of some kind. I have included what many would consider an ordinary word, ADIEU, in my top ten words because it can be so useful when you have a poor selection of letters (mainly vowels). An example would be a poor Scrabble tile rack containing the letters EUUIDIA and many players, new to the game, would exchange 6 of their tiles for new ones thereby losing their turn. Instead simple play the word ADIEU and score a few points whilst still getting 5 fresh letters for your next turn. Some of the top ten words can be pluralized and the simple adding of an S later in the game can yield good scores, especially if you use the S as part of another scoring word. Be careful as not all of them can have an S added. DZOS, JUTES and ADIEUS are alright for example but JOS and XUS are not valid Scrabble words, so I guess knowing your plurals is another tactic to learn. The electronic Words with Friends now comes to real life with its scrabble board game style. It is available for less than $20. If you do not have a regular partner to play against then you could play an excellent version online, which is available on Facebook. There is also another app there called Words With Friends which is very similar to Scrabble and will help your playing skills to develop. Be careful with this one because some of the letter values are changed and the treble squares are moved. Good luck in your Scrabble play and I hope this article has helped you to become a better Scrabble player. Yet another version of Scrabble has become popular on Facebook. Alongside WWF comes this word game called Wordosaur. The board is very similar to the Scrabble one but the big difference here is that you have 8 letters to play with per turn. The advantage of word forming with 8 instead of WWF and Scrabble's 7 is that you can achieve much higher scoring points. Tactically it is different but a good Scrabble player will master it quickly. Thank you very much for reading the Scrabble article and for commenting. Thats terrific now i can get better at the game. We all need that little edge on another player. Hi Eileen, thank you for your comments. Scrabble is enjoyable regardless of the level you play at, the main thing is to enjoy the word play involved and not worry too much about getting the high scoring 7 letter words in Scrabble. My 8.5 year old daughter and I have started playing Scrabble this summer as a way to help with spelling, problem solving, and just fun Mommy/daughter time. Thanks for these words which I can someday teach her! Thank you for your comments. Yes, Scrabble is a great way to help our children with spelling and even exploring new words. Challenging a word and consulting a dictionary is part of the fun of learning too. Encourage her to invent words and then look them up for their meanings, if any. Scrabble is the most educational game there is and all kids would benefit from playing. LOVE PLAYING SCRABBLE, THIS IS GREAT ADVICE. THANKS. Thank you for your comments, glad to have helped. I like giving Scrabble help to new players at our local Scrabble club. We have a designated Scrabble helper at all of our competitions, who acts a tournament referee as well as assisting novice players to learn some of the techniques of Scrabble play. Thank you for the "10 Best Scrabble Words." I have already bookmarked this article, and I will be coming back to it often. My family enjoys boardgames all winter - boy, am I going to impress them with these words. I can hear the challenges already! Thank you! Thank you! Thank you for your visit and comments. Glad the words helped and I hope you are successful in games with your family. These dark winter evenings are the best times for board game play. We had a tradition of getting a new board game every Christmas but the old reliable ones were always Scrabble and Monopoly. Learning ALL the two letter words is a very helpful task as well. ADIEU is a great word as is AUDIO which accomplishes the same thing from a slightly different rack. Thank you for visiting and your comments and I couldn't agree more that to become a successful Scrabble player you need to know all the 2 letter words (especially the more obscure Scrabble words like XU, CH, QI and KY). Thank you for visiting and posing this interesting question. I think that there is little doubt that different games will have different Top 10 words. The beauty of some of these game sis that you can play using your own agreed rules. For instance, in Scrabble, our family can rob the blank (by replacing the letter it represents)from the board and reuse it. In this way the blank can be used up to a dozen times in a game. The electronic versions, of course, do not allow such rule changes. Thank you for your comment and visiting this article. Unfortunately (or perhaps fortunately) I am a Luddite lol and do not own a smartphone so have not, as yet, had the pleasure of playing Word Feud. The concept is viable and word games are suited to electronic media devices. I play my Scrabble games on Facebook.